Caption (“Basic” tab) – Text that will be displayed in the progress bar. Progress (“Basic” tab) – Move the slider to indicate the progress displayed in the bar. 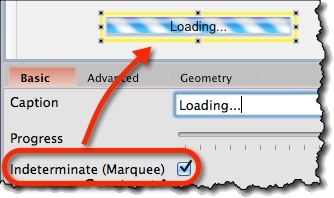 Indeterminate / Marquee (“Basic” tab) – Turn on to switch to “Marquee” style.